*Load a tablespoonful in little patty cases, refrigerate. Thoroughly mix all the ingredients in a bowl, then make balls or patties and roll them in the shredded coconut, sesame seeds or carob powder. Raw organic nuts, a handful each of whatever kind you prefer, I used hazelnuts, cashews and almonds. Chop them up carefully. Also I added a good handful of raw organic ground almond (bulk at supermarket). Add dried fruits. I used raw organic raisins, golden raisins, dried apricots, 4-6 figs, 4-6 medjool dates. Add fresh fruit. blend up two fresh apricots, a few strawberries, or a banana and add. On a piece of wax paper (kitchen parchment paper) form the mixture in the shape of a log. Sift raw organic carob powder through a tea strainer over the log and sprinkle ground almond over it, too. Voila! there's your Yule log (or raw vegan xmas fruit cake). 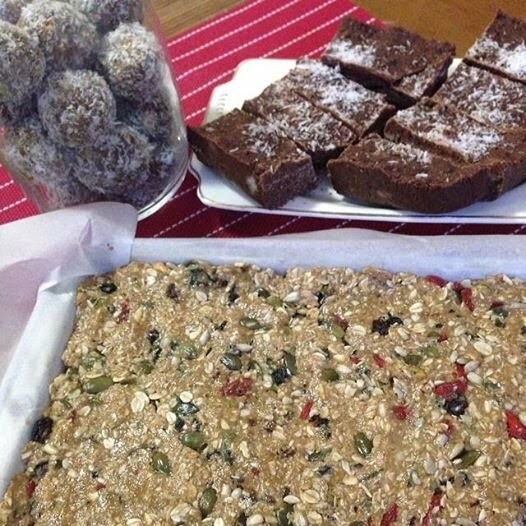 Here’s a delicious all raw desert or snack that will satisfy your sweet tooth. The recipe is taken from Rhonda’s Hallelujah Holiday Recipes from God’s Garden book (page 200) where it is called “Raw Sugar Plums.” Don’t know how it got the name “Sugar Plums”, because there is no sugar or plums in the recipe. But I do believe you will find this recipe yummy. *Organic ingredients are always recommended. Check out this amazing site for gourmet desserts! !